How To Use PRIMABLOCK to Participate in an ICO POOL? SCAM ALERT: ONLY SEND ETH to addresses you know are legit, don’t send ETH to a address someone posts in a forum or channel without verifying that it’s the correct address. You need to get ETH (Ethereum), you transfer the ETH from your wallet to the pool address, being sure to copy and paste in the DATA field info for the pool (or use the prefilled options). I use Metamask which is a Chrome extension, but there are stand-alone ETH wallets such as MyEtherWallet and MyCrypto. If you don’t have ETH, you need to purchase it. You can do that directly from USD at an exchange such as Coinbase which is highly trusted. More instructions can be found here at another blog post of mine: How to Safely Buy Bitcoin, LTC, Ethereum, and Altcoins. After you purchase the ETH, transfer it to your wallet. Important: You MUST use a WALLET address, not an Exchange address when participating in a pool or you will never receive your tokens (which you trade for coins once the ICO is over). I use MetaMask for a wallet which works great with PrimaBlock. Important: when installing be sure to backup/writedown your keys and phrases. You can also use a trusted exchange such as Binance or Cryptopia to convert your existing BTC, LTC, or other digital currency to ETH. Again, after you have the ETH, transfer it to your wallet. 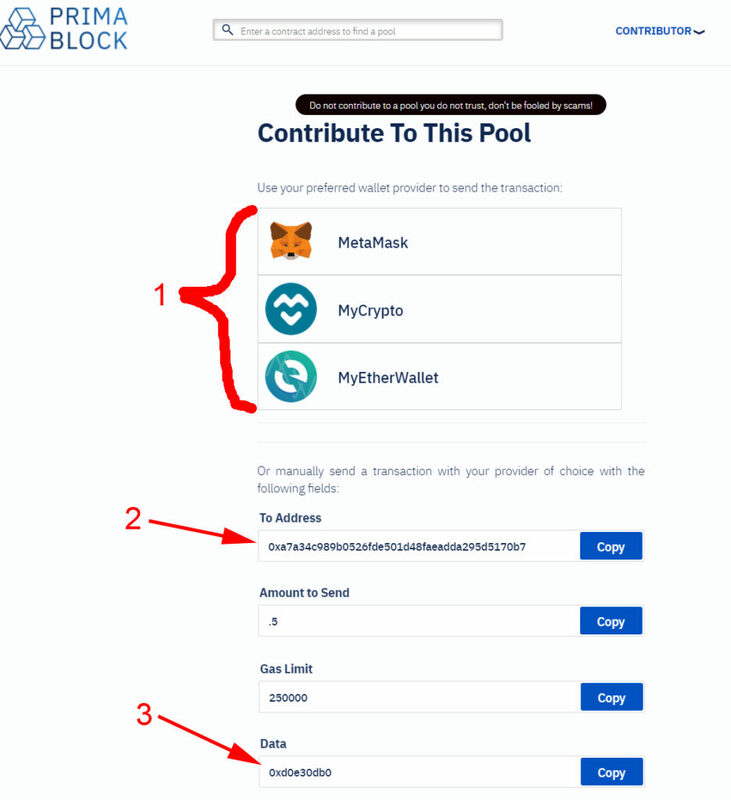 You then put YOUR ETH wallet address in the pool address field on PrimaBlock for the pool, set the amount of ETH you want to contribute and hit the contribute button. PrimaBlock has auto or prefilled options for the 3 most popular wallets: MetaMask, MyCrypto, and MyEtherWallet which filles in everything except the gas price. IMPORTANT: PrimaBlock will give you the pool address, the DATA field info, the amount, and the gas amount. It’s IMPORTANT that you copy and paste all these into your wallet’s fields when you send the ETH. IMPORTANT: If you don’t get the DATA field info into the transaction, then you’re probably never going to receive the ICO tokens. Hint: Bump up the gas to around 20 to make sure the transaction goes fast (gas is what you’re paying for the transaction to take place, the transaction fee). Until the pool is locked or finalized, you can return to the pool link later and add additional ETH, or even withdraw your ETH if you change your mind. Subsequent additions of ETH to the pool do not require you to meet the minimum: for example if the pool minimum is 0.25, the first time you will need to contribute at least 0.25 but you can return later and add 0.1 if you like. Once the pool organizer/creator (not me) closes the pool and sends the funds to the ICO’s dev team, they’ll give you proof of the transaction and info on when the coins will be distributed. To get your tokens after an ICO pool is closed: return to the PrimaBlock pool link. If locked you will see the number of tokens you have received, but you cannot get them, you’ll receive an error if you click the “get my tokens” button. If not locked click the “get my tokens” button and follow the prompts. 1) Click to contribute ETH to pool, see next figure for more info. 2) Amount of ETH you’ve contributed. 3) Use to withdraw ETH (you can do this until pool is finalized, or locked). PrimaBlock will display this info to you after you put in your contribution amount. 2) the address to SEND ETH to. 3) The DATA field for the pool – DO NOT LEAVE THIS OUT!!! Note: that if you use one of the linked wallets (MetaMask, MyCrypto, or MEW) you can just click those links to preload everything. Hint: Bump up gas to around 20.